Designing generic elements for BIM models is a time-consuming and tedious task. Where’s the fun in drawing the same features repeatedly every time you need to make, say, a railing? The building information modeling (BIM) industry is all about convenience and automation. With that said, it’s really no surprise that as with many aspects of our computerized world, there’s an app for that. 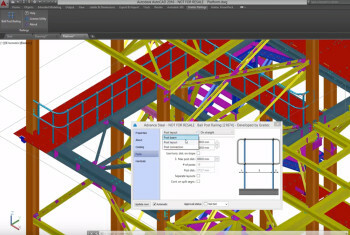 Recently, French BIM and CAD software vendor GRAITEC announced the Ball Post Railing Designer add-on. The aptly named software is an extension for Autodesk Advance Steel 2016 which can be downloaded for free. The following video demonstrates how it works. The add-on lets users create ball post railing systems in their building information modeling (BIM) designs. This can be done using either a manufacturer’s pre-built system or by designing a custom system. The ability to design on curved elements. Post length and ball size definition. Top and middle handrail adjustment. The ability to specify the number and distance of posts. Much like in earlier discussions about the benefits of ready-made BIM content, the Ball Post Railing Designer app is intended as a time-saving concept. It expands the options for pre-made designs in BIM and reduces the need for architects and engineers to create generic parts repeatedly. “The new Ball Post Railing Designer app for Advance Steel is the first of a range of powerful applications from GRAITEC dedicated to increasing productivity and saving vast amounts of time during the modeling process,” said Carl Spalding, product strategy director at GRAITEC. The Ball Post Railing Designer promises to be a useful little tool for steel detailing, construction and structural engineering. For more information and to download the Ball Post Railing Designer add-on for Advance Steel, check out the GRAITEC website.